Project DescriptionThe Capital SouthEast Connector Segment D3/E1 Project is located in the City of Folsom, Sacramento County, and El Dorado County, California. The Project site is located along White Rock Road from approximately the White Rock Road and Prairie City Road intersection to approximately the intersection of White Rock Road and Latrobe Road in El Dorado County. Segment D3 is from Prairie City Road to the County line and Segment E1 is from County line to Latrobe Road. Between Prairie City Road and Carson Crossing Road, White Rock Road is currently a two lane rural road with no shoulders and steep side slopes into open side ditches. Between Carson Crossing Road and Latrobe Road, White Rock Road is currently a three lane urban thoroughfare that has been semi-improved with curb, gutter, sidewalk, landscaping and sound walls at intermittent locations. Existing overhead utility poles run parallel to the roadway between Prairie City Road and Scott Road (north) and a railroad line crosses White Rock Road just east of the Placerville Road/Payen Road intersection. 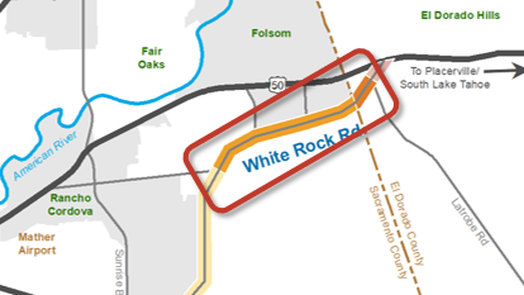 The Project functions independently and is a gap closure from the completed Sacramento County improvements on White Rock Road to the White Rock Road improvements in El Dorado County near Latrobe Road. Between Prairie City Road and Carson Crossing Road, White Rock Road will be reconstructed on a new alignment as a four lane expressway with a center earth median and an adjacent Class 1 bike/pedestrian trail on the north side of the alignment. Intersections will be signalized and Scott Road (south) will be realigned to connect with Prairie City Road. This stretch of the Project will also include utility relocation, drainage facilities including drainage basins, and linear basins along the roadway. Between Carson Crossing Road and Latrobe Road the surrounding area has been developed into a residential zone and existing White Rock Road will be widened to a four lane thoroughfare with curb, gutter, and sidewalk and an on-street Class II bike facility. Portions of White Rock Road are already widened to four lanes. Intersections will be signalized. This stretch of the Project will also include utility relocation and drainage facilities along the roadway. The Project will meet the projected traffic demands for the next 20 years and will include intersections at major cross streets. The Project area includes additional footprint areas determined through constraints analysis of future High Occupancy Vehicle (HOV) lanes on the western portion of the Project between Prairie City and Scott Roads, grade separated overcrossing (located at the existing railroad along Placerville Road), and future improvement of select intersections to interchanges (“Phase 2” improvements). Utility relocations will take place as part of this Project. Construction of this segment will be completed in phases, depending on the availability of construction funding. Increasing development encroaches on open space and wildlife habitat and there is a lack of wildlife crossing along throughout the project area. Provide wildlife crossings at key locations within the Project area. CEQA Tiered Environmental document for D3/E1 completed.